The East coast was my favorite part of Taiwan and I have only seen a small section! There are steep cliffs, a stunning blue ocean, marble mountains and green jungle. It’s also much less populated than the rest of Taiwan, only 4% of the Taiwanese live on the East Coast. 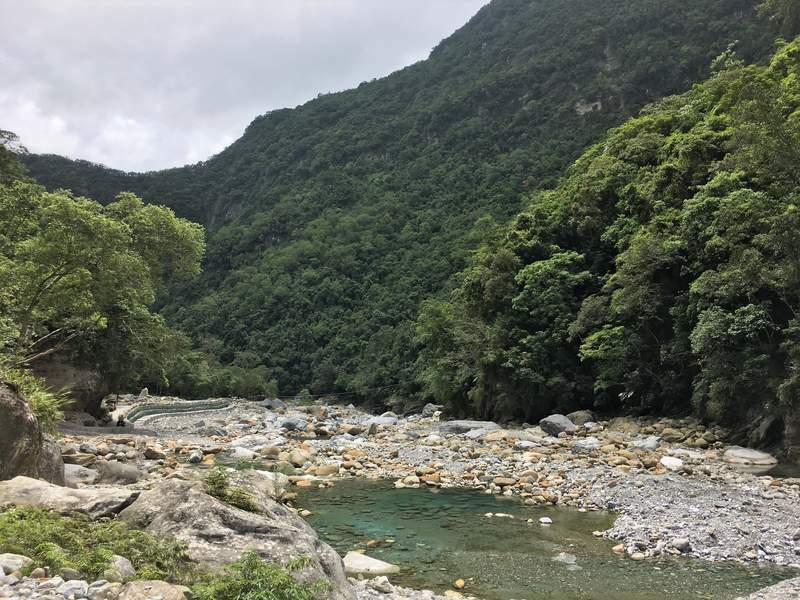 We spent 3 days (plus 1 travel day) in Hualien and used this relaxed city as a base to explore the famous Taroko Gorge and the gorgeous Qingshui Cliffs. During our 1 month trip I was surprised about the low number of (Western) tourists in Taiwan (except in Taipei), it’s such a beautiful country and well worth a visit! 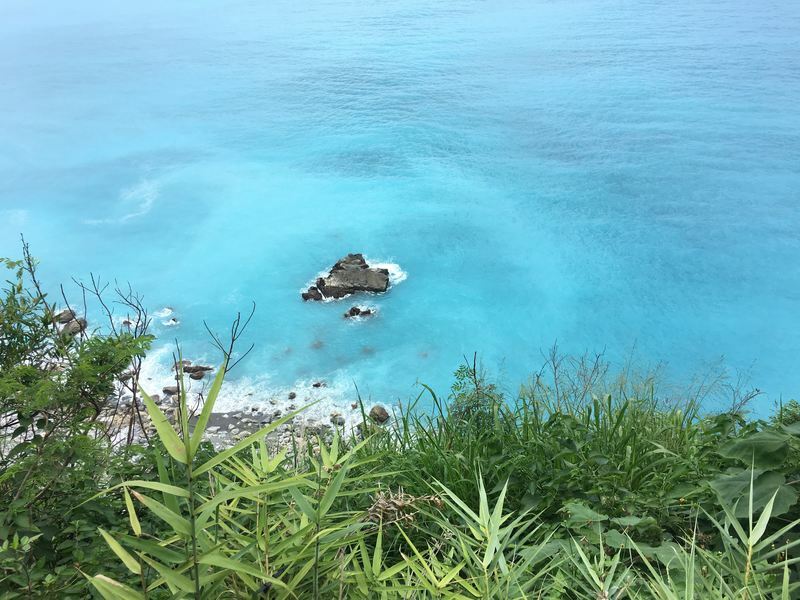 When I was researching where to go in Taiwan, Hualien was the first place on my list. Why? 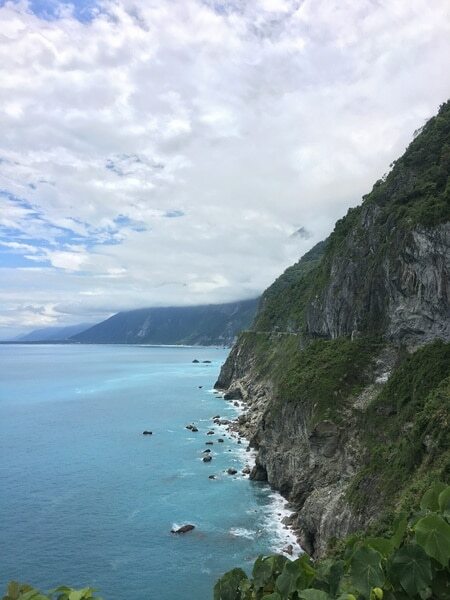 Because the Taroko Gorge is very close to Hualien and the pictures on Google made it immediately clear this place was a must see! The weather forecast hadn’t been great for this day (unsurprising since monsoon season was about to start), but we were very lucky: blue skies and only a bit of rain at the end of the day. 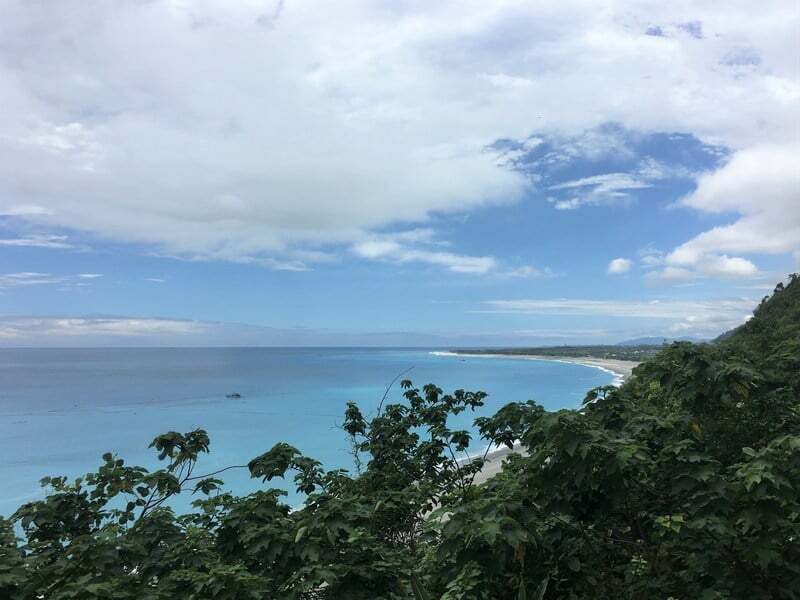 And the views kept getting better and better… I couldn’t stop marveling at the beautiful color of the ocean. And the impressive steep cliffs of course! 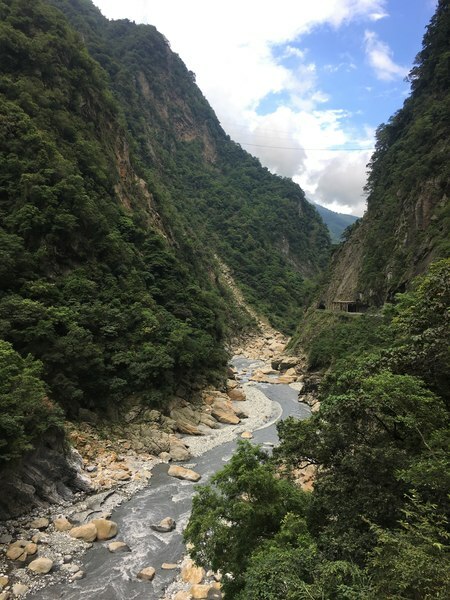 After peeling our eyes away from the breathtaking cliffs we turned our scooter around and drove to Taroko Gorge, one of the nine national parks of Taiwan. We picked up a map of the area at the Tourist Information Center and entered the gorge. 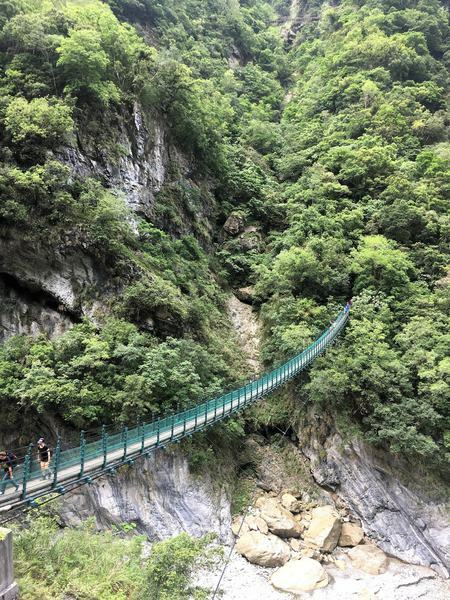 Our first stop in Taroko Gorge National Park was the Shakadang Trail. This easy trail leads along the Shakadang River, it was a fairly busy trail but still very nice! Next up was the Swallow Grotto trail (pictured above), you can either drive this path or walk (20 minutes one way). 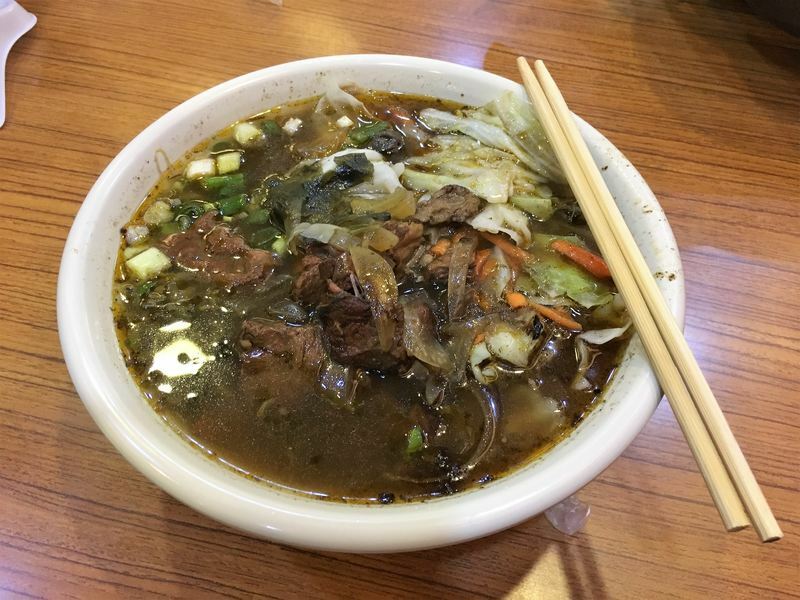 We had lunch in Xiulin Township (beef noodle soup of course, a Taiwanese specialty;-) before turning around and driving back the same way, all the while admiring the steep marble cliffs around us. 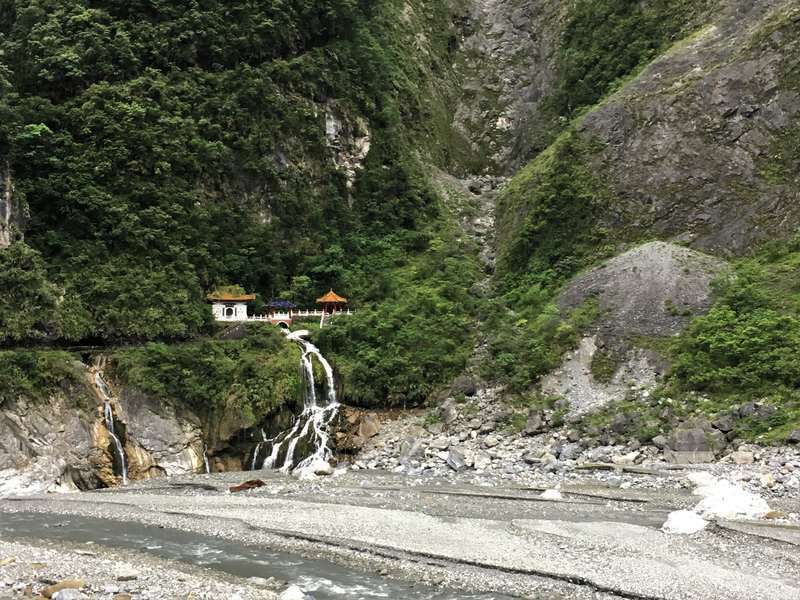 On our way back we quickly stopped at the Eternal Spring Shrine, but by that time it had started to rain and we quickly drove back to Hualien to relax in our cosy hotel room. The next day we hopped back on our scooter and instead of driving north we went south. We passed Nanbin Park where I had a lot of fun taking the picture below. ‘Too bad’ I’m already married, it would have been an original way to propose;-). Via the bridge at Ji’an we entered the so-called ‘East Coast National Scenic Area’ and scenic it was! We drove along the coast and came along the Farglory Ocean Park. We didn’t go in but it looked like a lot of fun! At the tiny village of Shuilian we turned inland, a very adventurous drive! The road kept getting bumpier and muddier so we drove very carefully… But the views along the way made it worth the effort! If you decide to drive this road, be careful and make sure you have enough petrol. We didn’t come across any other people and the road didn’t look like it was used a lot. Nevertheless, we had a lot of fun driving this deserted road and eventually made it to the West side of the peninsula. Via the Yuemei bridge we crossed back to the mainland and drove to Liyu Lake, our final stop of the day (because it started to rain again). 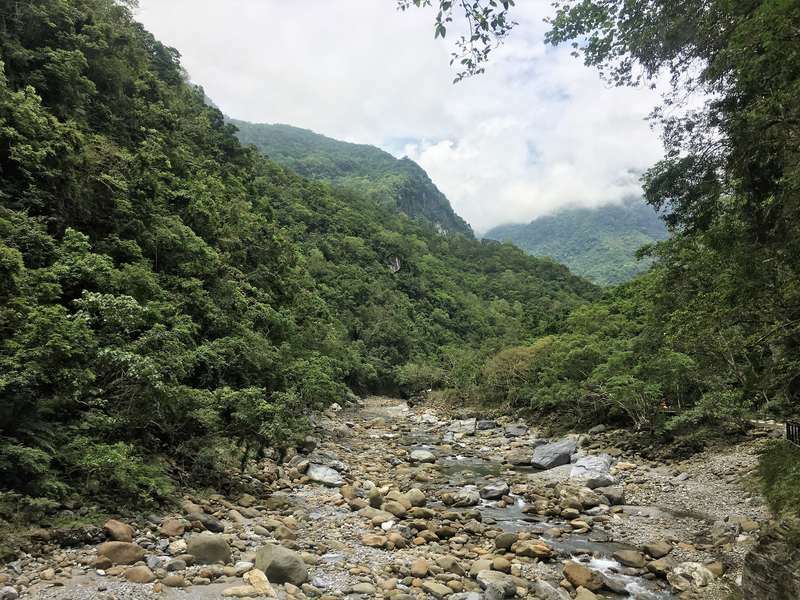 I really liked this Southern loop because, unlike the Taroko Gorge, there were very few other tourists! Unfortunately it rained almost the entire day, but we made the most of it by sampling the local cuisine. 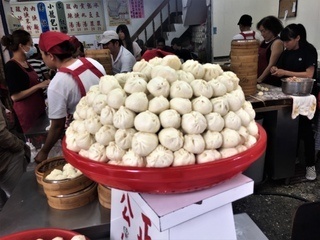 We found the best baozi and located Hualiens famous onion egg pancake (see pictures below, exact location marked in the map at the start of the post). And of course we couldn’t skip the famous Dongdamen Night Market! Luckily the rain stopped around 6pm and we sampled several delicious snacks at the market. I mentioned this in my other Taiwan posts as well, but traveling in Taiwan is surprisingly affordable! 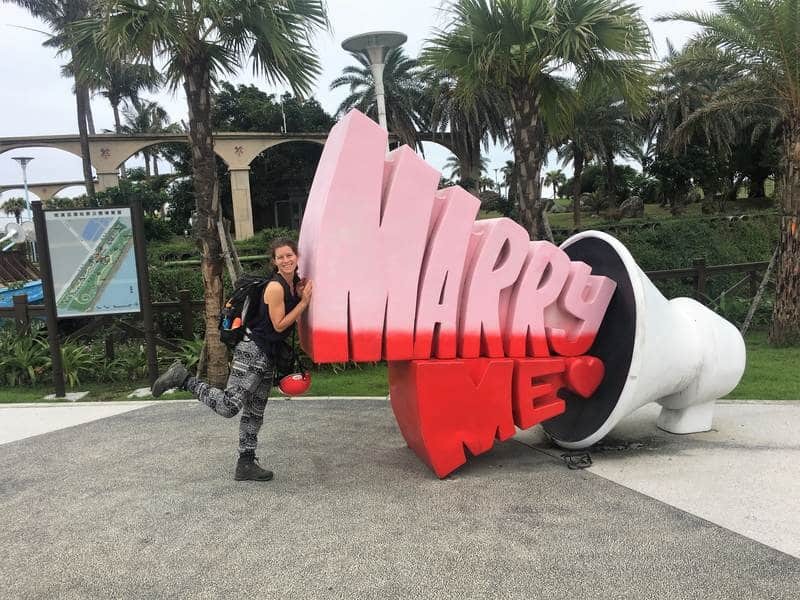 During our 3 days in Hualien we spent approximately €68 per day (for us as a couple, so €34 per person). This budget includes the scooter rental (and petrol), transport from Taipei to Hualien and back to Taipei, our accommodation and all the costs for food. 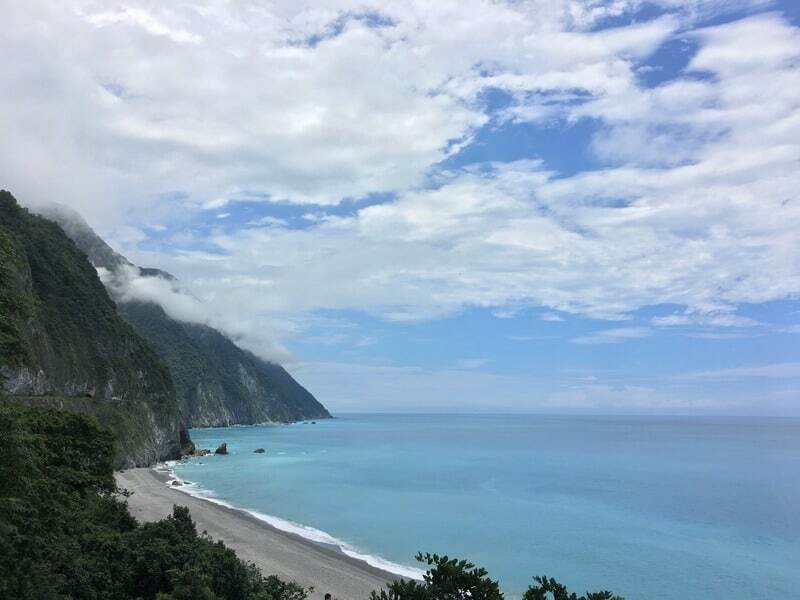 Below you can find more information about our accommodation, how to travel to Hualien and how to get to Taroko Gorge. This was our favorite accommodation in Taiwan because of the cute Bee theme design! Our room was very big with a super comfortable bed. We even had a sofa and small desk. The bathroom was modern with an excellent shower. The hotel also has a really cool family room with a castle, I can imagine it must be a dream come true for little children to sleep there. I don’t have a picture of this room but you can see it on Agoda. On the 2nd floor there is a hot and cold water dispenser, plus any additional items you might need during your stay (towels, toiletries, water bottles, maps of the area, bus schedules, etc). WiFi was very fast. • Duration of our stay: 4 nights. • Price: €25 per night for the weekdays and €33 for Friday night. • How to book: check Honey B Trip B&B on Agoda and Booking. 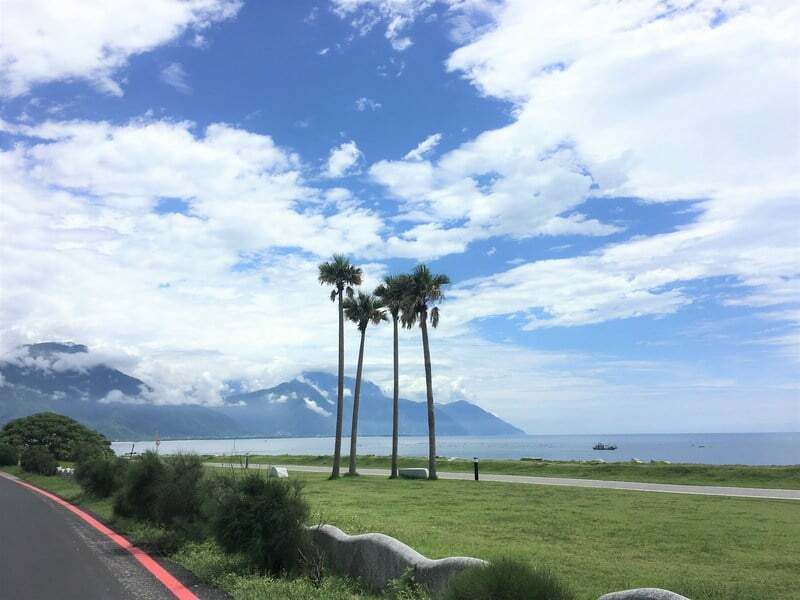 There are several ways to travel from Taipei to Hualien. The fastest way is to take the express train, a ticket costs 440NT and the journey takes about 2 hours. However, these tickets are often sold out. We traveled to Hualien with a combo-ticket, you can buy this ticket at the Taipei bus station. From Taipei we took a bus to Luodong and at Luodong we boarded the train to Hualien. A combo ticket costs 222NT and the trip takes around 3 hours. Altogether it was a very comfortable trip and in my opinion the lower ticket price is worth the extra travel hour. For our sightseeing activities we rented a scooter. As I explained in my Kenting National Park post, it isn’t easy to rent a scooter in Taiwan as a foreigner. You either need a Taiwanese license or an International Drivers License which clearly states you can drive a motorcycle. However, in Hualien we were in luck because the friendly owner of Honey B Trip B&B helped us! She went with us to the scooter rental company and talked with them in Chinese. I am a 100% certain we wouldn’t have gotten a scooter if she hadn’t vouched for us. 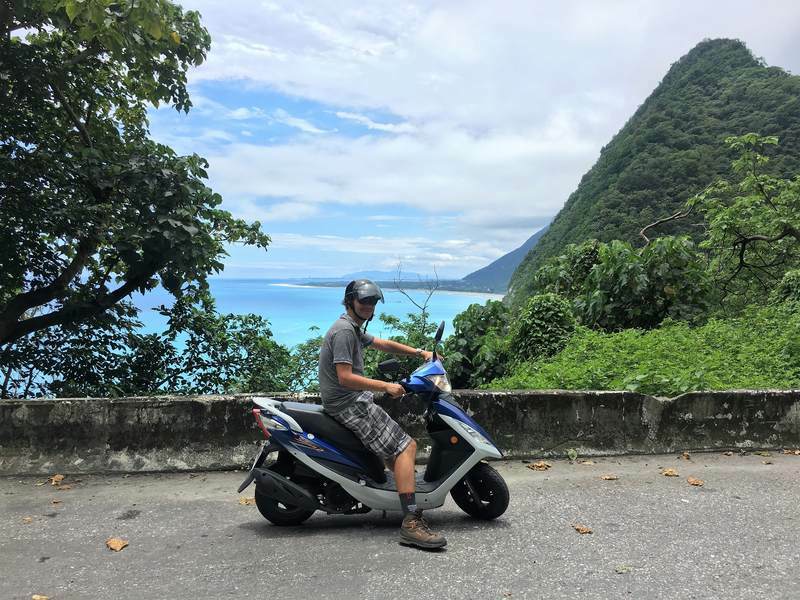 But don’t worry if you cannot get your hands on a scooter (or don’t want to drive one), you can still visit Taroko Gorge! 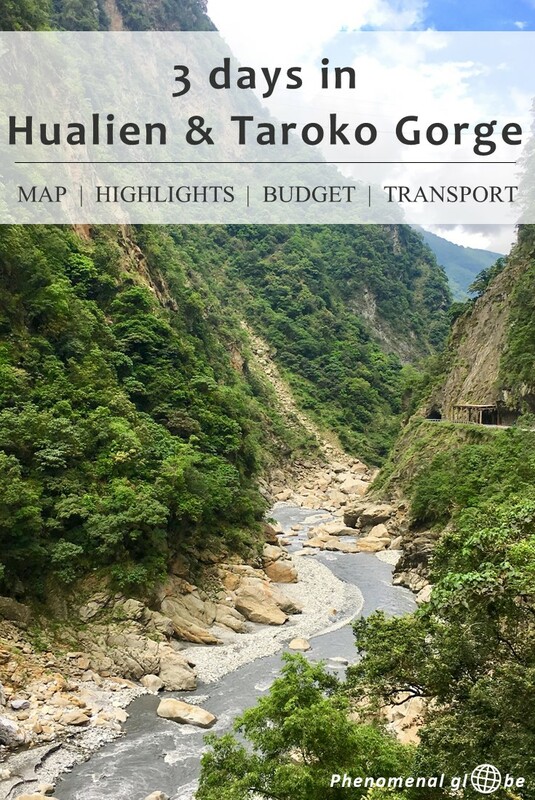 Taiwan has excellent public transport and there are several buses a day from Hualien to Taroko Gorge. More information and the bus timetable can be found on this site. 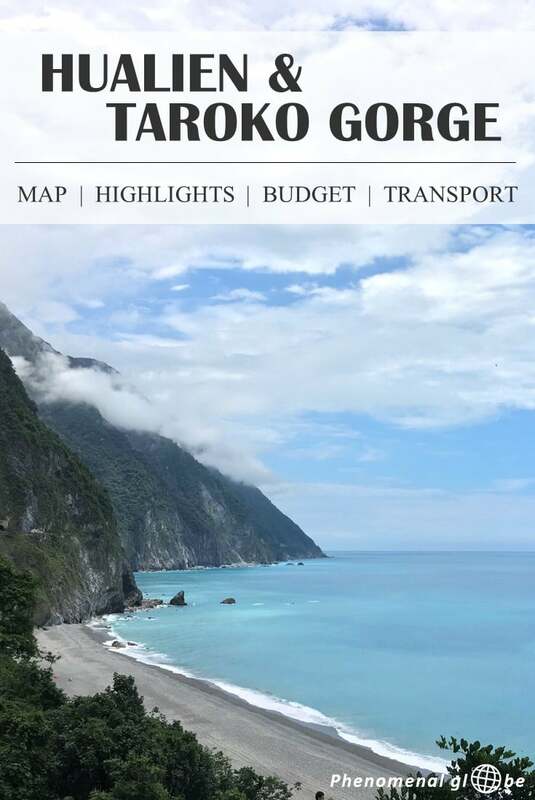 Want to get of the beaten track in the Taroko Gorge? Check out this post about hiking to a secret tribal village. Planning a trip? Check out the Phenomenal Globe Travel Planning Library and my Travel Resource page! What an adventure, Lotte! Ever since I went to Hong Kong I have wanted to explore more of Asia. The color of the sea in your photos takes me back to the crystal blue ocean in the Bahamas. Stunning! You make me travel in my mind 🙂 ! I will be making a solo budget trip mid Jan to Feb 2018. Thanks for the great info. Just a few question. 1) are there cheap guesthouses in Kaoshiang city, preferably with windows that you have come across? I have booked online hotels in the past and always the photos don’t match the real thing. 2) What is the maximum ATM withdrawal in Taiwan dollars per one time.? I am using my Visa debit card. 3) any problems using simple english with the locals? 4) are the street signs in chinese and also english for tourist to get around? 1. The Airbnb I stayed at in Kaohsiung had big windows and even a balcony. Since that’s the only place I stayed in Kaohsiung I don’t know about other hotels. 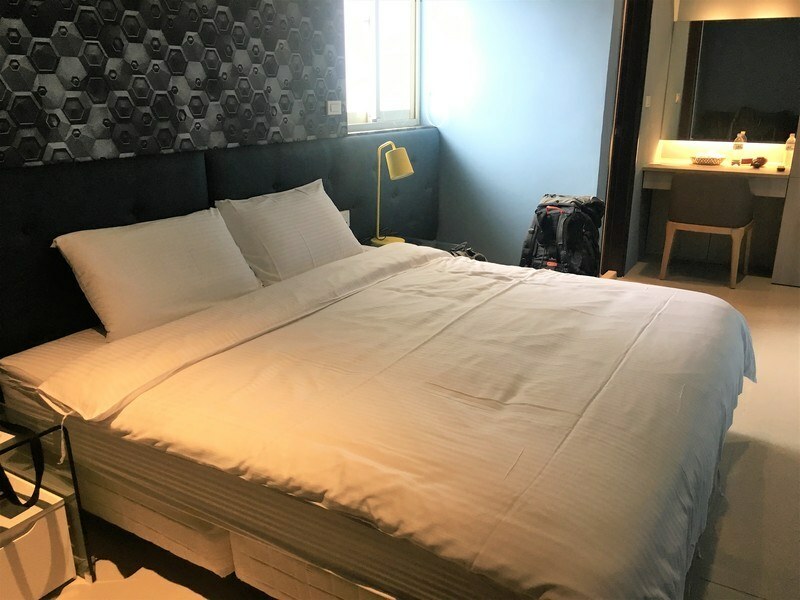 You can find all the information in my accommodation post: https://www.phenomenalglobe.com/budget-accommodation-taiwan/. 2. The maximum withdrawal is 20.000NT, not all banks work with all bank cards so just try a couple and see which branches work with your visa card (I have a Maestro and Mastercard so unfortunately don’t know which banks accept visa). 3. It depends on where you are but yes, that could very well be a problem. 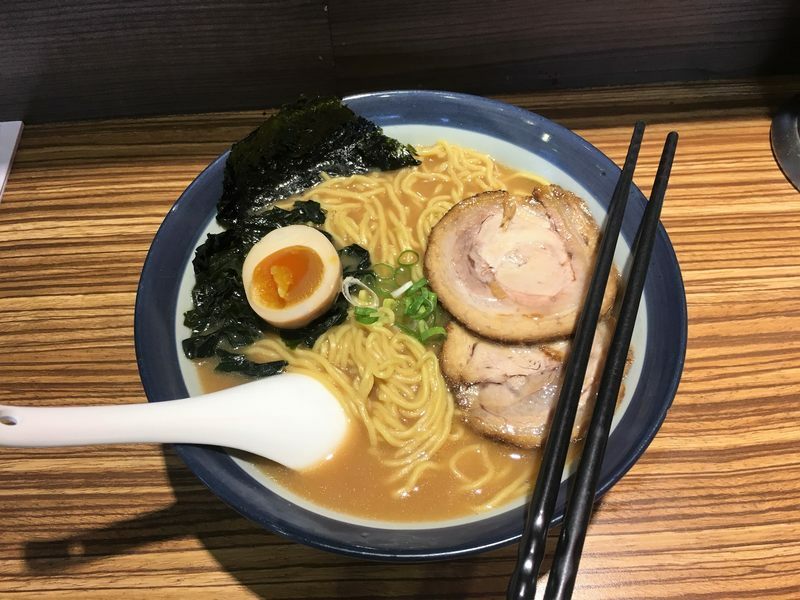 In Taipei most people speak a little English, but even there we came across small restaurants or shops where people didn’t understand us at all. It helps to have a internet, you can use google translate to communicate. Taiwanese people are extremely friendly and always willing to help even if they don’t speak English so don’t worry about it! You can mine and sign your way around. It sometimes means you’ll end up eating a very surprising dish;-). 4. Many signs are only Chinese, I recommend downloading the maps.me app and make sure you have the offline map for Taiwan. Mark your hostel/hotel on the map so you’ll always know where to return to. Or take a business card if the hotel has one so you can give it to a taxi driver and he’ll know where to take you.